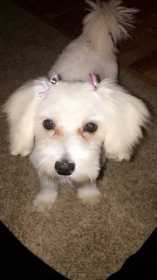 Lost Malti-Pom tan dog. Very friendly to strangers and especially children. Dog-Tag has her name on it Smoochie and my phone number. If you see her or have any information leading to her rescue, there is a reward.